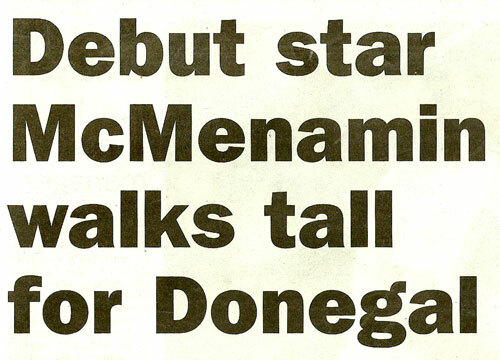 Debut star McMenamin walks tall for Donegal- Character and courage have little to do with pounds and inches, and Donegal’s very own ‘little big man’ – Kevin McMenamin, walked tall in the cauldron that was Carrick on Shannon. G McLaughlin, Irish News, July 2008. Donegal qualify for McKenna Cup final: The elusive Kevin McMenamin was a constant thorn in the side of the Orchard defence, always out in front to claim possession and offload to effect. David Walsh was the chief beneficiary of Wappa’s impact. http://www.Breakingnews.ie – April 22 2009. One to watch: McIvor hasn’t been afraid to introduce new talent and Kevin McMenamin has shown he knows where the posts are. Kevin McMenamin presented with the Ulster Gaa Merit award for January after scoring 11 pts in the McKenna Cup and 1-2 against Cork in the National League. Irish News, 10th Feb 2008. Diminutive in his appearance, Kevin McMenamin has been far from miniscule over the past few weeks with the Termon native being one of the finds of the season. Saturdays game was a first for many reasons, it was Donegal’s first ever game under lights, and the first time they had ever flown to a game, and a certain Kevin Wappa McMenamin is fast establishing himself as a tiny corner forward with a sharp eye for goal as he finished with 1-2 on his league debut v Cork. Team of the week: Bustling corner forward is a real livewire and although his size could go against him, McMenamin has plenty of heart, and scored 4 pts. Gaelic Life, 2 Feb 2008. Wappa has really excelled during the league with his strong runs and ability to take important scores. His ability to deliver pinpoint passes and win his own possession is also a major factor in his play and he has been developing as a key member of the Donegal attack. I was impressed by him, short and strong, a real live wire corner forward. Micky Culbert, Antrim Manager. Feb 2008. Brian McIvor will be looking for a few rough diamonds to glint during the gloomy month of January, Kevin McMenamin might just be one of them. A real find for McIvor, the Termon man is a flying machine and has been scoring freely as part of a two man full forward line. A great debut for Donegal the Termon man scored half his sides total in a man of the match performance. Gaelic Life, 10th. Jan 2008. Wappa stars in Donegal debut. Irish Independent, 8th. Jan 2008. Daily Mirror, 8th. Jan 2008. The Sun, 20th. Jan. 2008. A five star performance from Wappa on a day that was anything but suitable for a player of his size and stature. Donegal News, 8th. Jan. 2008. Donegal make final stand…..a superb McFadden pass on 44 mins led to a brilliant goal from Kevin McMenamin. Irish Independent, 22 April 2008. Keith Higgins restricted Donegal’s wonder boy Kevin McMenamin to one point. Mayo News, 22 April 2008. Ulster semi final 2008 – Donegal sub Kevin McMenamin was sent off for a second yellow card offence – throwing the ball at his namesake Ryan. ….like most people, the manager’s son was impressed by Kevin McMenamin, “he was brilliant, his tackling was tremendous, if we could get all six forwards to tackle like that and he scored 4 points. His point from play was fabulous and his movement was great. Paul McIvor, Donegal Management Team, Donegal Peoples Press, March 2008. Giant effort from little Kev gets the job done – Kevin McMenamin making his Championship debut set up five scores including a goal for another debutant, Michael Murphy. Gerry McLaughlin, Irish News, July 2008. The fans in the green and gold were on their feet when a sweet pass from McFadden sent Wappa free inside the ’13’ and with a drop of the shoulder he crashed the ball into the roof of the net. Letterkenny Post, 25th. April 2008. 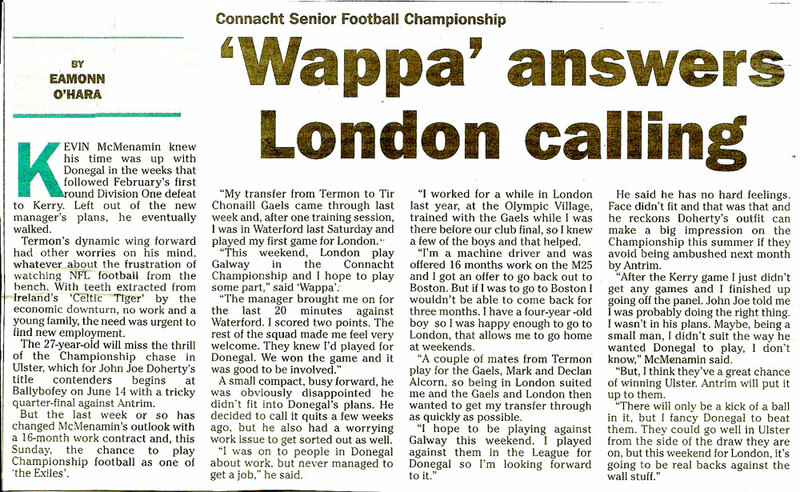 Wappa – Termon’s goalscoring machine – in Termon they simply call him Wappa but the name of Kevin McMenamin has swept across GAA circles like wildfire over the past few weeks- a hat trick of goals in the county semi final has catapulted him into the spotlight. Donegal shine stateside – the wee Termon man Kevin McMenamin with seconds to go stepped up to send a 40 yard free over the bar to tie the final. 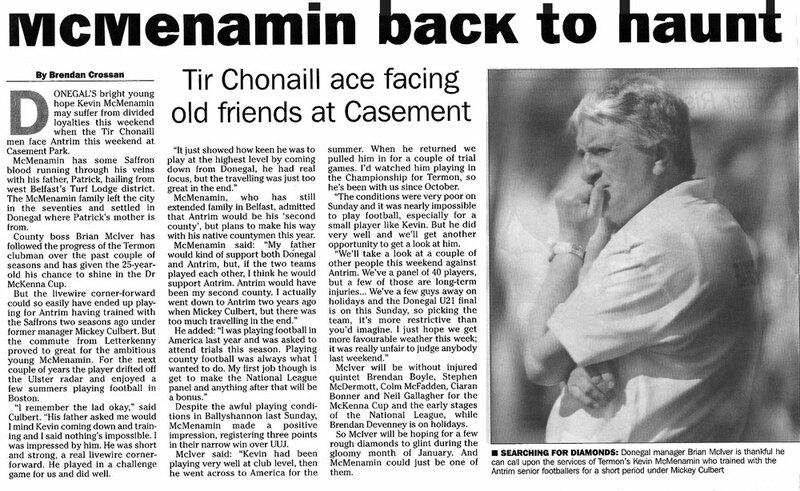 Donegal News, 3 Sept. 2004. Termon’s big hero was the baby faced assassin Kevin McMenamin who cooly rifled home 3-4 in an opening half that will live long in the memory. Undoubtedly the star of the show was 20 year old corner forward Kevin McMenamin who bagged 3-3 before the interval to almost single handedly put the game beyond reach for the opposition.